Sleeker, pro inspired design modeled off the HH4500 helmet, passes the mirror test and has modern appeal. Offers the flexibility to adjust to various head shapes for a personalized and proper fit. Helmet Weights and Widths are determined using a size medium non-combo helmet. A little more expensive than I initially wanted to pay, but it's shown to be worth the price. Comfortable, light, easily adjustable - overall a good investment for protecting your head. I really like this helmet. I prefer the way that this helmet adjusts to your head. It's really comfortable for me. I really enjoy this product. I recently bought this after using my last helmet for a long time. This helmet is very comfortable and light. I definitely recommend it. This helmet is very comfortable. I feel it's lightweight and air moves through it nicely. I have not crashed with it so I can not comment on that. It has a quick adjust on the back of the helmet which is a nice feature. I'm not a seasoned hockey player. Honestly I'm just getting back into the game after a 20 year leave of absence. I'm loving every second out on the ice and I feel very confident wearing this bucket. My son loves the helmet, is light weight protective and comfortable. On the down side, on the website we ordered a medium based on the sizing chart on the site, however it did not fit. Had to return it and pay return shipping - $23 UPS vs the $10 cost for it shipping to us. Then had to order the next size up- another $10 in shipping for a total of $43 in shipping charges which is ridiculous and Hockey Monkey gave absolutely no credit for shipping or consideration so I dont plan to buy from this site again as a result so fair warning to anyone reading this. Not a very happy customer!! upgraded from the bauer 7700 helmet and the reakt fits like a glove. no pains at all and very protective. I use all bauer equipment, and this helmet is probably the best helmet I have used. ive taken a couple of big hits and I felt fine after, because this helmet absorbs impact super well!! I play bantam AA hockey and I got this helmet after a couple of my teammates got concussions. The majority of my team has this helmet, and as of right now nobody has gotten a concussion! There is a reason why it is worn at all levels, and many pro's/college/ juniors players wear it, it offers unreal protection. It is certainly and investment, but, it is a product that has protected me in numerous hits and has inevitable prevent me from concussions. 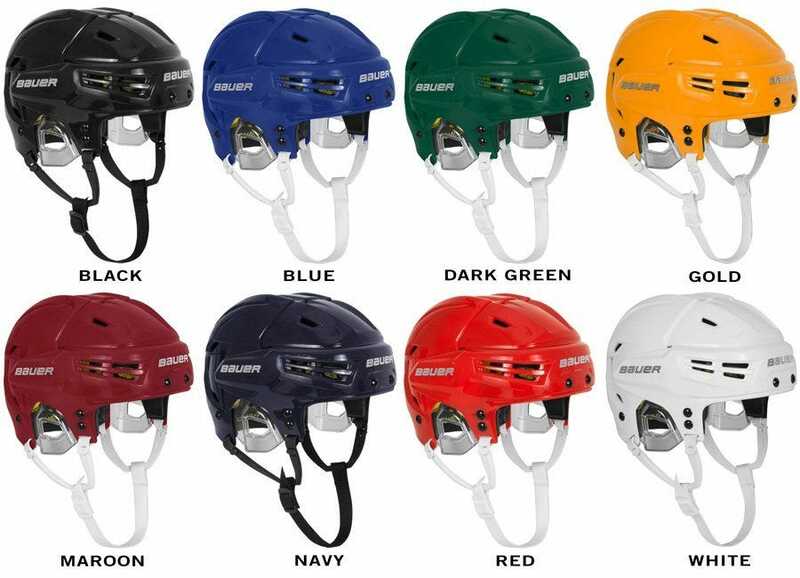 I recommend this helmet, and I can guaranty that you will be satisfied with all Bauer products. The Helmet is covered against defects in manufacturing and workmanship for a period of 365 days from the date of purchase.